It’s mid-January and chances are your resolve about New Year’s resolutions has started to wane a little bit. Have you been sneaking in a treat here and skipping a workout there? Most likely. And if you committed to saving more money in 2017, chances are you’ve already started slacking on sticking to your new budget. One little latte won’t hurt… you tell yourself as you go to Starbucks. But you really need those winter boots that just went on sale! These are the lies we tell ourselves to continue living the life we’ve been living. It’s much easier to stick to what we know, than to make ourselves feel uncomfortable and shoot for the life we know will make us feel better. When my husband and I paid off more than $45K of debt, it was really uncomfortable, but we were used to living like broke newlyweds. Since we paid off our debt, and doubled our income, lifestyle inflation has slowly creeped in, and it’s been hard to focus on meeting our longterm goals, like saving for retirement, saving for a new house, and saving for our child’s future. We vowed that in 2017, we would get our act together and start saving once more. And yet it’s been hard to get rid of our old ways. Here are three ways we’re committed to reach our savings goals in 2017. Every Friday after work, I have a date with my budget. I scheduled Friday, because that’s the most convenient time for me and my husband to sit down with a glass of wine and pour over our budget. We see what we spent money on that week, add up all our respective categories, and see what expenses are coming up. It helps us communicate and make sure that we’re not neglecting the budget. Friday afternoons is also when we allocate money into our savings account. Doing it weekly instead of monthly makes it easier on our budget. If we intend to put $100 a month into our Christmas fund, it’s much easier to set aside $25 a week, then it is to put one large chunk down. This makes it much more likely that we’ll save money. Between my husband and I, we have about eight different savings account through Capital One 360. Capital One 360 is our online only bank that we use strictly for savings. We keep our checking account with Bank of America. The reason we have our savings separated is because it makes it harder to transfer money between them (there is about a two-day waiting period) and in turn, makes it harder to pull the old “oh, well, we’ll just take $500 out of savings this month so we can spend it on useless things…” trick. We also label all eight accounts for their intended purpose. Rather than having one savings account, and naming it savings, we have several accounts that help us visualize what we’re saving for. One account is named Emergency Fund and this account is never touched unless it is a true emergency. We have another account named Vacation, another one for Christmas, another one for Retirement, one for our Car Insurance, another one for Christmas… etc. Having all these different accounts really helps us feel like we’re saving with a purpose rather than to just have money in the bank. This is key to reaching your savings goals. Saving is our priority. As soon as we get paid, money is automatically transferred into our savings accounts. By saving first, we make sure we avoid not having any money left over at the end of month. 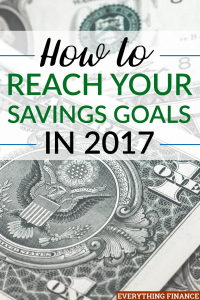 If you want to reach your savings goal in 2017, you need to make sure you put saving first. What are your savings goals this year? What are you doing to make them happen?